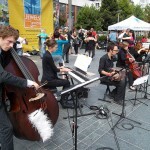 With much excitement I introduce a new guest contributor, Andrea Bindereif of Andrea’s Tango Blog. 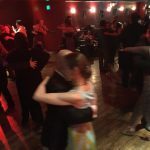 I came across her blog recently and was blown away by her journalistic style of writing and in-depth stories on the Bay Area Tango community. Andrea, born, raised and educated in Germany, came to California in 1994, worked as a freelance journalist for some of the most important daily German newspapers, started her own small translation business and soon discovered the passion of her life – dancing. 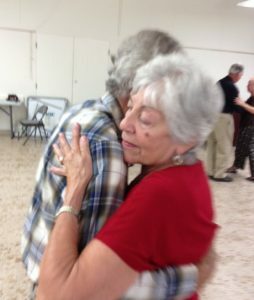 For her first post on SF Loves Tango, we chose a moving story she wrote about Ivan Shvartz and his Tango classes for seniors and veterans. 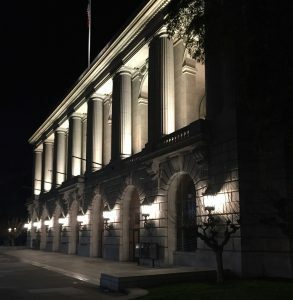 Although this article was first published in 2015, it’s still quite relevant today. Waverly Jenkins was 64 years old when he suffered a severe stroke. Back then, about 4 years ago, he collapsed in his home in Washington, D.C., and lay helplessly on the floor for several days. He couldn’t get up, he couldn’t walk. Half of his body was paralyzed. It took him two days to make his way across the floor to the phone and to call his friends back home in Berkeley. But what Waverly had not realized up to that moment, was that he had also lost his ability to speak. His friends were unable to understand what he was trying to say. All he could do was mumble in an incomprehensible way; he was no longer able to form words with his mouth. He had lost control over his speech. His friends 3,000 miles away realized something was very wrong and called an ambulance. He was taken to the hospital where he stayed for 35 days, receiving in-patient treatment. 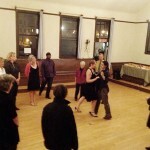 A couple practices their connection at a recent class. For Ivan Shvarts, stories like Waverly Jenkins’ should no longer come as a surprise. 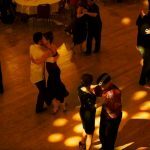 He’s been teaching Argentine Tango to people ranging from the 50-somethings to 90-somethings since 2009 and has seen many of them go through major transformations, both physically and mentally. Some of them had been using walkers or other walking aids for years, but learned to move without them after taking up Tango. He shows me a video from one of his students at the Veterans Memorial Senior Center in San Francisco. “This 93-year old lady is one of my favorite students,” he says proudly. I’m watching a tall, well-maintained lady as she moves around the room with her walker, but who then follows Ivan to the dance floor, leaving the walker behind. She enters his embrace and begins to move rhythmically to the music, a big smile on her face. On another video, he shows me Mr. Way, a relatively new student who is at the same time the oldest one in his classes. At 104, Mr. Way appears surprisingly agile and shows a fine sense of humor. As an American citizen who was born in Japan, he says that “they cannot decide whether I’m 104 or 100 years old. But it doesn’t matter to me!” Learning to dance a complex dance like Tango seems like just another thing to learn that he’s curious about. “I’ve been dancing for 30 years,” he explains, “but mostly Swing.” He delivers a touching little performance with his partner for the camera — proof that Argentine Tango can be danced at any age. His steps may be small and his repertoire still limited, but he dances with his heart and soul to the music and with perfect phrasing, providing the perfect frame for his partner. 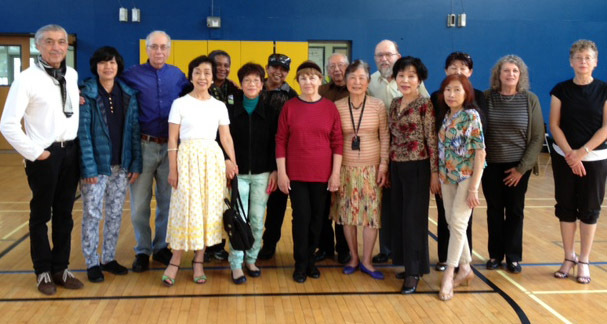 Ivan’s Tango class takes a break from dancing for a photo. 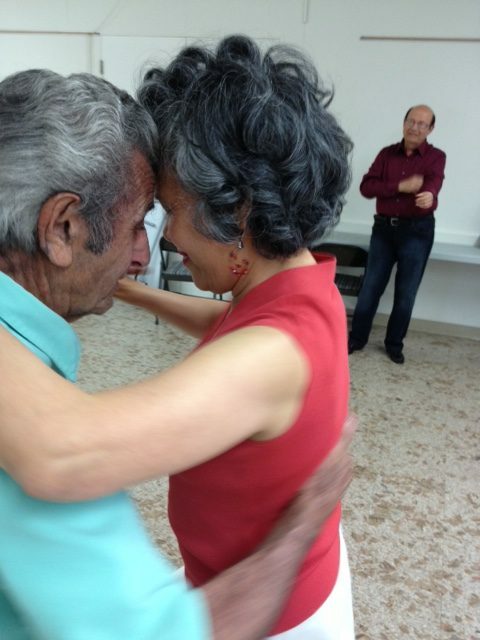 Why do people come here and what are the benefits of learning Tango, even at an older age? “It gives me more flexibility”, says Irina who is also practicing Yoga and goes regularly to the gym. Because of Tango her body now has the flexibility that she wasn’t able to achieve through any of the other exercises. “It’s so important to stay flexible as we get older,” she says. 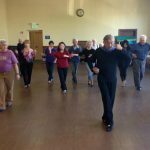 As our muscles tighten and our body shows symptoms of aches and pains that we didn’t have in our younger years, Tango can help to stay fit even at an old age. A couple practicing their tango embrace and walk. His own mother was a passionate Tango and ballroom dancer for most of her life. After she died in 2000 at the age of 91, Ivan found a note at her bedside. She had written that she wanted him to learn to dance Tango. “She died in the afternoon,” he says, “and the next day I took my first Tango class.” He fell in love with it, traveled to Buenos Aires, took classes with some of the most famous teachers, and began teaching seniors himself after moving to San Francisco from Los Angeles in 2007. 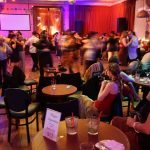 His classes gradually grew from 6 to 30 students, and now with three classes per week plus a milonga every Sunday he is quite busy. His senior Tango program which, as he says, benefits seniors and others physically, mentally, and socially, has now become a non-profit organization and offers scholarships for seniors with disabilities. Ivan lovingly named it ‘Golden Age Tango Academy’. It is a fine reference to the ‘Golden Age of Tango’ from the mid-1930’s to the early 1950’s which produced some of the greatest orchestras and composers, Juan d’Arienzo, Francisco Canaro, and Aníbal Troilo among them. 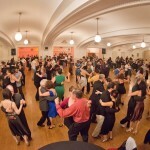 Ivan Shvarts is the founder of the Senior Tango Program in the Bay Area. 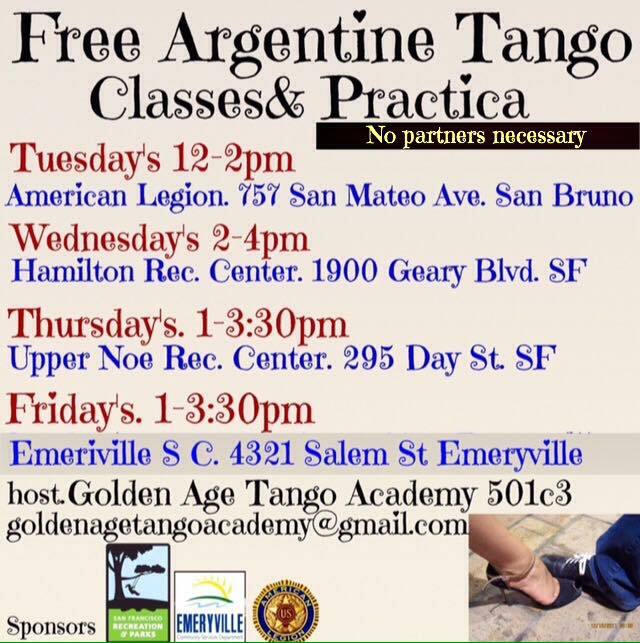 He has been the official tango instructor for San Francisco Parks and Recreation since 2006. He teaches both group and private classes in Emeryville, San Francisco, and San Bruno. 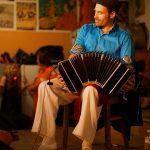 Ivan is committed to providing a welcoming space for dancers of all levels and ages to develop their tango skills while simultaneously growing a community built on a celebration of movement and music. He is interested in how tango is a physical, emotional, and psychological dance that works out the body, the brain, and the soul. 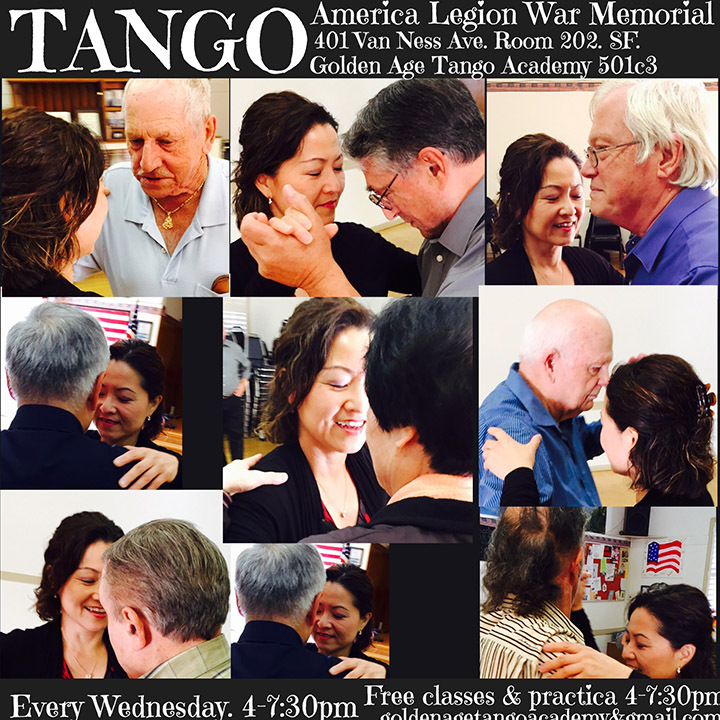 Learn more about The Golden Age Tango Academy. 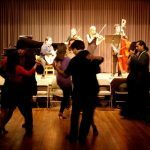 Tango for Everyone: Milonga La Paz every Thursday and Sunday from 7 -11pm. Great article, Thank you Andrea & Maika !!! !